I am always up for something different, a challenge if you will, on a Sunday. I have more time than any weekday prior, and I am a rejuvenated version of myself from the Saturday off. I have time to search out unique ingredients, slow roast meat, patiently babysit the evening’s dinner, and do something a little extraordinary. We always open a bottle of wine, watch a movie or the HBO series de jour and enjoy a celebration of the wonderful weekend. I love Korean food so when my husband and I saw this recipe in the New York Times from Momofuku in NYC, I was intrigued. 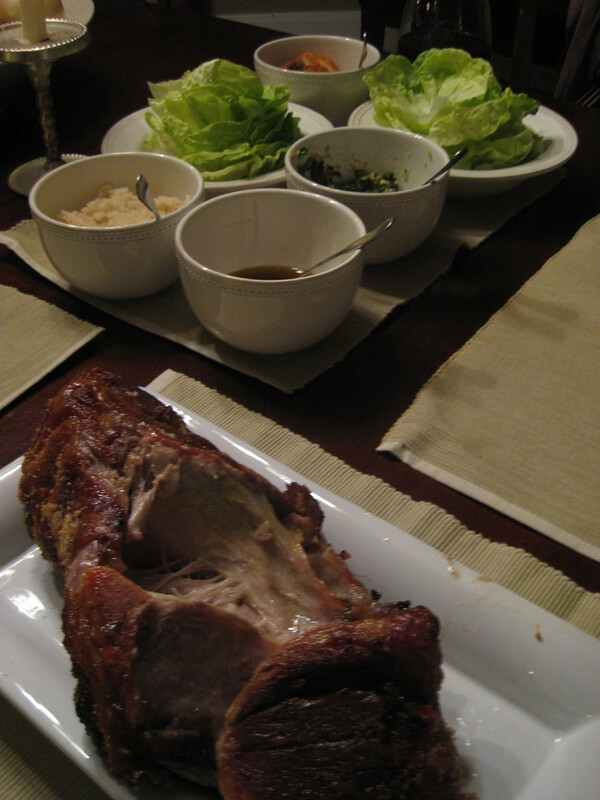 Essentially, Bo Ssam is a slow roasted pig that is then served with many accompaniments and sauces to be wrapped with rice in a lettuce leaf. A version that serves 6-10 people (like the recipe below) goes for $200 at Momofuku. And for good reason with all of the ingredients, time and love that goes into it. It looked like quite a production – the perfect meal for a Sunday night. The ingredients are easier to find than you would think, with the exception of kimchi which resulted in a trip to our Asian market to purchase. Could you do without one item? One sauce? One accompaniment? Sure. But do you want to go through all of this effort and be one element short? I don’t think so. The Bo Ssam was worth every effort I put into it. And, it is quite an impressive feast when spread out on a table. 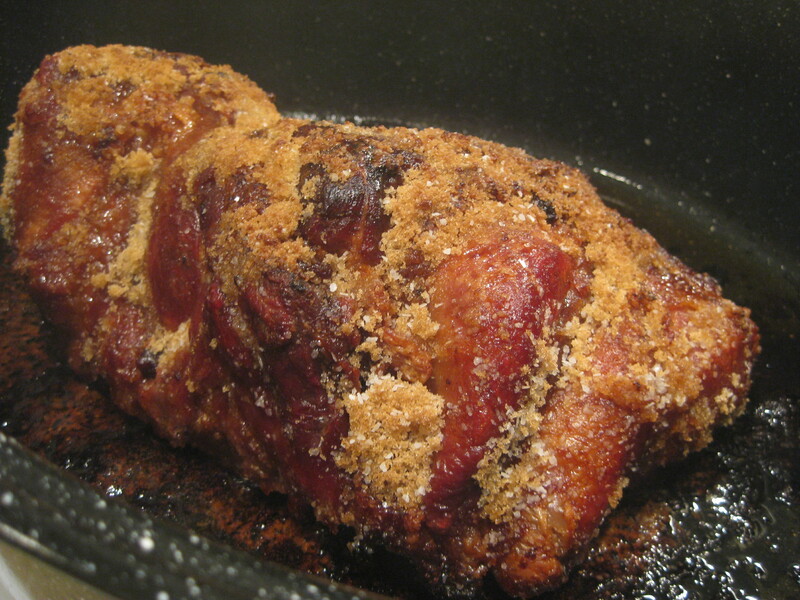 The pork is so tender it falls apart, and has such a deep flavor, despite not having excessive seasoning. And every sauce, every element goes perfectly together in the lettuce. With leftovers the next day, I shredded the pork, mixed in some of the sauces, and we made sliders. Also delicious. So if you have a Sunday when you are feeling up for something special, I highly recommend this recipe. Because of this size, it also is perfect for entertaining. Although much cheaper than a flight to NYC and $200 to eat this at Momfuku, I officially put that experience on my to do list. I am sure it is worth every penny. Kimchi (available in many Asian markets, and online). 2. When you’re ready to cook, heat oven to 300. Remove pork from refrigerator and discard any juices. Place the pork in a roasting pan and set in the oven and cook for approximately 6 hours, or until it collapses, yielding easily to the tines of a fork. (After the first hour, baste hourly with pan juices.) At this point, you may remove the meat from the oven and allow it to rest for up to an hour. This entry was posted on June 24, 2012 at 3:45 pm and is filed under Pork. You can follow any responses to this entry through the RSS 2.0 feed. You can leave a response, or trackback from your own site.